Using the Google Books version of Harden's book, we can locate six instances where American pants usage could safely be swapped out for trousers. 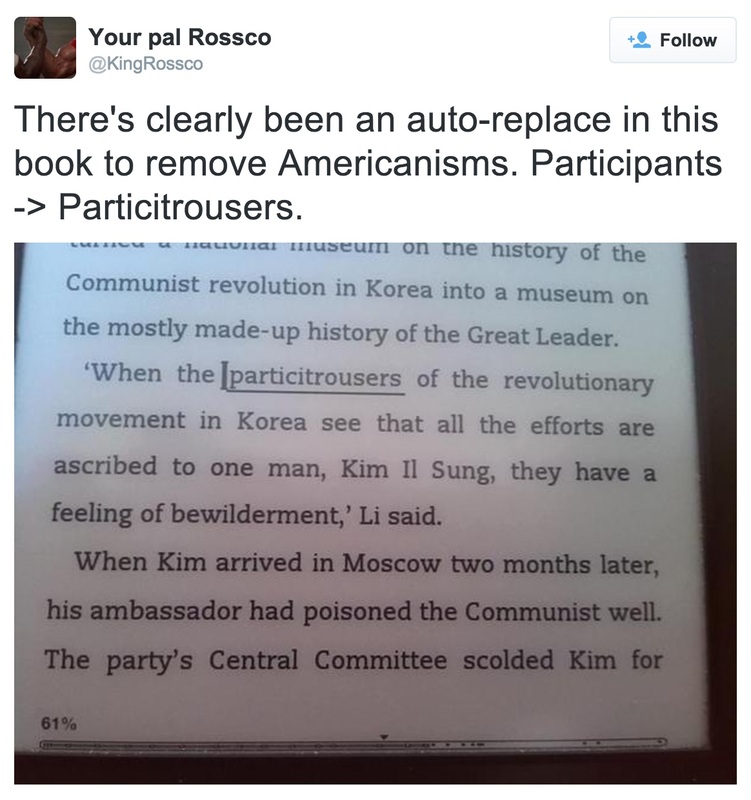 But the search-and-replace mission went too far, finding the substring pants in the sentence beginning, "When the participants of the revolutionary movement in Korea…"
This isn't the first time that sloppy e-book editing has led to search-and-replace follies. A few years ago, we learned of an edition of War and Peace for Barnes & Noble's Nook e-reader in which all instances of Kindle were replaced with Nook, leading to sentences like "It was as if a light had been Nookd…"
On Twitter, Julia M. Wright noted that the search-and-replace artifact particitrousers also appears in a gobbledygook blog post from "Education Expert ON-LINE." That's a case of inartful "article spinning," automated synonymization performed on text so as to render it distinct enough to get past the search engines. (See my 2013 post, "Anatomy of a spambot.") In the same blog post we see other errant substitutions such as advanlabeles for advantages and giftations for presentations, so the change isn't specifically caused by pants avoidance. As the joke indicates, the trousers/pants distinction was a source of anxiety at the turn of the 20th century, at least among Anglocentric Americans who recognized pants as an inappropriate word. (Pants started off perfectly innocuously as a chiefly US shortening of pantaloons in the early 19th century, well before the UK "underpants" usage complicated matters.) Americans these days don't worry too much about pants getting misinterpreted, but the usage disparity is still creating headaches for trans-Atlantic editors. "but the usage disparity is still creating headaches for trans-Atlantic editors"
Most assuredly not. It is creating headaches for publishers too cheap to hire editors, perhaps, if their heads have the capacity for aches. Interestingly, there may be a second transatlantic misunderstanding in Butler's poem: apparently a haberdasher in North America sells men's clothing, whereas a haberdasher in Britain sells small clothing-related bits that North Americans call "notions." Not that I had any idea about this before I looked it up. But this means that the character in the poem had in actuality an ever-so-slightly stronger claim to respectability than Butler would have interpreted him to. "And this is an area where anyone marginally competent in NLP technology could do better than parcipitrousers. You'd think that MSWord or one of the high-end publishing platforms would offer an "Atlantic Crossing" app"
Fairly heavy-handed for most circumstances (Kindle/Nook aside). A 'find whole words only' function on auto-replace would have prevented most of these, though 'find whole words only' is more difficult than it might initially seem to get right. My favourite error of this kind appears on http://forums.devshed.com/visual-basic-programming-52/get-folder-83452.html. I tried to use a piece of code copied from that page, and it fails because the word SHITEMID ("Shell Item Identity") has been changed to ****EMID. I worked on a dictionary once that had been Americanized on the cheap, with all instances of "to let" changed to "for rent". Resulted in sentences like "The guard refused for rent them past the gate." My British edition of The Hunger Games has got elabourate and evapourate because they tried to Britify the American spelling of words like labor and vapor and I guess they used search-and-replace, too. Or did someone really think these words would be spelled with -ou- ? Pronunciation is different, isn't it? One of the local phone companies here changed their name last year, from Telecom to Spark, and did a global find and replace on their website. Which resulted in their website proudly announcing that they were the leading provider of Sparkmunications services. I heard of a church where two elderly, female parishioners died in the same week. To save time, the order of service for the second funeral service was made by a find-and-replace of the first woman's name by the second woman's name. All this would have been fine, except for a certain line in the Apostles' Creed, which became "Born of the Virgin Edna". My usual link to one of my favorite examples of how search-and-replace can cause great dawizard. At the very least, you'd expect a sensible regex-based search-and-replace, e.g. although that would still leave howlers like "Spot trousers so loud, I can hear him out here." I'm opposed to this dumbed-down "translation" of books anyway. The British edition of the Judy Moody children's books has "dustcart", which I think many British kids wouldn't understand at first. Someone needs to educate these publishers on the wonders of the regular expression, which is capable of solving so many of life's little search-and-replace problems. It can also wreak much greater havoc in the wrong hands, but with great power comes a great responsibility to double-check your work. "You'd think that MSWord or one of the high-end publishing platforms would offer an "Atlantic Crossing" app…"
Actually, that's available, and some editors would choose to use it to save time on routine substitutions so they could concentrate on subtler differences. But, again, if the publisher's only interest is in minimizing cost, there is no editor involved, and using sophisticated software (with the exception of Excel) is not the forte of publishers. I'm not sure if the pants/trousers distinction matters now. As a Brit, I almost never say trousers and almost always say pants. And under my pants are underpants. "As if the earth in fast, thick trousers were breathing." —Coleridge, "Kubla Khan"
As for the haberdashers, it was said that when a certain highly placed administrator left the University of Chicago for Woolworth's, he had gone from ideas to notions. The all mouth and trousers bog, er, blog. Sid Smith, I would say you're in the minority: I would be very surprised to hear a fellow Brit use "pants" to mean anything other than trousers (unless they were using it in its insulting slang sense). Oops, I meant the complete opposite: that in British English, "pants" almost always means only "underpants" (or, relatedly, is a way of calling something rubbish). Bathsheba said nothing; but he could distinctly hear her rhythmical trousers. A message board made me refer to Rembrandt's painting the "Nigh****ch". It's not only expletives. I had difficulty advertising an apartment near Guy-Concordia metro station, because the message board was worried about gender discrimination in rental ads. My solution was to beat this stupidity with stupidity and write "G uy". Not a big issue for human readers.